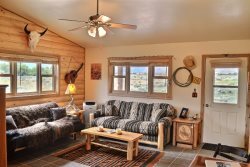 The Aspen Villa is a newly renovated cottage located just 2 blocks from downtown Cody. The homes central location is exceptional, being walking distance to an array of local shops, dining options, and attractions. If the outdoors is what your craving, then you're in luck! Cody is an outdoor lover's paradise ranging from being the hub to Yellowstone's East Entrance to seeking out the wild horses of McCullough Peaks. The cozy, rustic-chic nature of the home will truly feel like your home away from home. Enjoy your morning coffee or evening cocktail on the homes large front deck, while shaded by the grove of aspen trees. Aspen Villa is great for any type of traveler! Has a cozy living area and full kitchen. With three furnished bedrooms, each having there own full bathroom this would be perfect for couples wanting that little extra privacy. I worked with Sandi. Very nice from beginning to end. I would be interested in working with her again on finding us a place for next year. I rented the property for my son, his girlfriend and their little boy. Was very pleased seeing the property. Loved it as did they. I will be contacting your team for next year. Received a call thinking that maybe a pair of sandals left in the property were ours. They weren't, but I certainly appreciated the call. Nice, quaint property. Decorations simple, but very nice. Loved the touches of wood. The shower was a piece of art within it self. Lovely home. OnNightly rate is based on an occupancy of 6. Additional guests will be charged an extra $10/night/guest.